In the middle of the madness of the civilized world, they still exist, and much more accessible than you think. A few hours from Sao Paulo, you can find refuge in beaches still safeguarded from human destruction. Full of trails and desert places, is not the ideal destination for couples with children, but for adventurers on duty, the beach is perfect. Ilha Comprida has about 70 kilometers long, and how much farther below, the beaches are more deserted. Not so deserted thereby Juruvaúva Beach (photo) is worth knowing because it has huge dunes, up to six meters high and also a wrecked ship that attracts some divers. The Beach of Araçá, with dunes and no tourist infrastructure, is virtually the paradise of the isolated, in the best sense of the term. It has some simple houses and is located six kilometers from the center. The Ponta da Praia, 10 kilometers from the center, is very wild, with dark sand dunes and trails. It is common to see fish swimming in its waters and at night the starry sky is a sideshow. Although the beaches of Peruíbe are too full, simply follow the road Guaraú - Una to get to the Camborê beach, empty, with a few streams and a camping area. Leaving there, after a 20 minutes of walking, you arrive at Praia Deserta (Desert Beach), whose name could not be more obvious. The only structure that it has are two clean water spouts, but it’s always good to take your bottle by guarantee. One end of the beach forms a natural pool and the beautiful stream that flows into the sea has a clean water, where bath is released, no alarms. 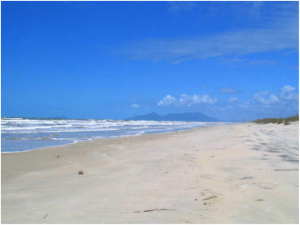 Access here is done by Tabatinga Beach, located right on the border between Ubatuba and Caraguatatuba. This little paradise is first come first served. Small right! They are only 25 meters long, with clear waters and coconut trees. And for those who want to rest or practice water sports, Praia da Figueira is the place. Its calm water is perfect for fishing and diving. Located in Ilhabela State Park, the access can be done by trails from the Beach of the Castellanos or Indaiaúba. An important detail when it comes to Ilhabela: never forget the insect repellent!